← Markets & A Pop-Up Shop! It’s been ages. Which is an understatement. I’ve been doing stuff but not the things one might imagine. So this is a recap to remind myself that cool stuff can happen, even if you’ve ran out of money, lost your special work space, and virtually had to start all over again like a newbie scratching around for old skills and fumbling for the new ones. Humble pie tastes OK when there is still the after taste of all the things you’ve done and seen and made to remind you of what was possible. This is me, taking stock of some of the things that filled my last year and a half, and they all begin with the letter ‘R’. Last year I had a market stall at the Lang Lang Rodeo. It was filled with T-shirts & other merch that I lovingly screen printed to sell to the locals. Being an actual local myself I was proud as punch to be there and it was a rip-roaring success. Yay for me. My first actual profiteering market stall and the last one I’ve been able to do for bloody ages. My Dad and Uncle Hughie were on the Lang Lang Rodeo committee for over 50 years. There’s even a book about the history of it with photos of my young father & his cousins riding their horses and my great Uncle Hugh, the founder of the whole thing, looking very important (if not a little stern) in his felt fedora hat and blue ribboned lapel. Not sure what the ribbon means but it looks official. Anyhow, needless to say there is a family connection. The Rodeo was always on Easter Monday (and still is) and as a kid it was SO exciting to rock up to the showgrounds for a day of cowboys and carnies and possibly catch a glimpse of Chad Morgan while lining up at the apple shaped fritter truck. The action began with skydivers parachuting onto the oval followed by a series of events including the dog high jump, the barrel race and the famous ‘Beaut Ute’ muster. Although we weren’t allowed to mix with the ‘unsavoury characters’ at the hoe down, we were given special treatment by sitting in the cowboys’ grand stand, where my Dad was timekeeper every year, overlooking the bucking bronco’s and mad bulls, which is where the real drama took place. Sadly there are no more Bourke’s involved in what is one of the oldest Rodeo’s in Australia’s history. RIP Hughie & Dad. I got married! Yes. People still get married even when they’re a bit older- and maybe, a bit wiser. And to keep it real we tied the knot just up the road in South Morang. It was at this amazing place called Farm Vigano where Mietta O’Donnell’s grandparents lived back in the 50’s. The history is almost as good as the wrought iron clad, blonde brick house surrounded by patios, apple orchids and rose gardens. It was suburban kitsch heaven for me. Loads of class with an artisan flourish. Mario Vigano & his artist wife, Maria, were instrumental in starting the whole Italian fine dining scene in Melbourne in the late 30’s. Mario’s restaurant was situated in Exhibition St and was actually my grandparents favourite place to dine. Whou’da thunk it?! Anyway, our wedding day was super casual & fun everyone seemed to have a good time. I finally managed to relax after the speeches were over and the wedding dance, which my husband resisted till the end, was done. I mean who could resist Prince?! We mixed it up, religion wise, by skyping Stefan’s Jewish Dad in Israel, reciting Islamic Scholar – Rumi’s poetry, while Father Bob Maguire, a christian, took care of the ceremony. We didn’t want to leave anybody out. My Mum was so happy that it was a half catholic wedding and my partner was happy because he loves Father Bob and the amazing humanitarian work he does, as do I. My Bouquet! by Badland & co.
Cake by my cousin Marcia – icing intact! After having a big break from the ABC, last October I returned to Ripponlea to work on a cute TV documentary called ‘Backroads‘ about small towns around Australia. I designed the opening titles and all the graphics for the show. It was especially fun because the (mostly female) program makers were great to work with, and they have asked me to do it all again this year. I also had a big stint at video editing and cut 6 different corporate videos and promos in a really short amount of time – which nearly killed me. I worked with other clients who required animated infographics and discovered that I quite like making them, no matter what the subject matter. I worked out that, strangley, I’m not cut out for designing car ads but I’m good at doing things for art galleries and films. We took our super groovy caravan out camping for the first time ever last January. We did OK. Three days in the time warp, that was Point Leo Caravan Park, was enough for the teenager, who insisted on sleeping in a tent by herself as we got eaten alive by mosquitoes inside the van. Smart cookie it turns out. But it was better than I thought it would be. Who knew that you could make pizza’s on a BBQ! I’ll be honest, we DID take the coffee machine (& the toaster, the kettle, the computer…) Perhaps is wasn’t 100% real camping but it was a fair dinkum holday. Toast IS good from a toaster, but… Sitting with our camping buddies drinking wine and eating cheese until the sun went down was the highlight. These lovely friends are experienced campers and know how to live small. Which is a good thing as they live on a boat, which is actually a catamaran (which they built from scratch!) and is almost ready to set sail, to who knows where, very soon. I can’t imagine what that would be like. But I’ll be logging into their instagram to find out. Refurbished van by the boatbuilder himself. So when we got back from holidays we had the first ever mini renovation in our lives. We made a storeroom into a kids bedroom, with a skylight big enough to see the stars twinkling at night and the clouds float by during the day. A loft bed pokes up into the atrium style space which feels like you’re living high up in the clouds. We put an attic in our roof to shove all of our stuff into – so much stuff! And it has made the two young girls very happy now that they can play with their electronic devices separately and not kill each other in the process. But will we ever see them again?! Oh yes, there’s that thing called food. I moved into a proper art studio. Yes I did! It has floorboards and white walls and awesome views. Which is like some sort of miracle. But it really did happen and I’ve been there for 6 months now and loving it. My plan was to use it for art and screen-printing etc. and also use it as a work space for my animation and motion graphics work. So far, the latter has mostly happened. I bought a super computer and learnt some new 2D animation software, called Duik, and started working for a company called Sketch Videos who make these funky, sketchy corporate videos. I also hooked up with the NGA & the Museum of Contemporary Art to knock out some stuff for them so I’ve been too busy to do my own project work and I’m still completely crap at working out how to make time for it. Help! Reading Liz Gilberts’ Big Magic was an inspiring start though. Good news is, I have finally moved my giant work bench up the five flights of studio stairs & I am now able to start playing again. Is just getting better and better. I love it here. The hipster joints next door are fine but when you’ve got Misty’s Diner and Sargents bakery on your doorstep who needs the Food Truck Park?! That said, I do like Dexter, & Stray Neighbour, which I am more than happy to frequent, but I’m loving the fact that Rezza hasn’t changed much since I moved here 5 years ago when I won the raffle at the local RSL – which was like a Lang Lang ‘Dinner Dance’ circa. 1980. Which is why I wanted to be involved in this other thing happening in Reservoir very soon. 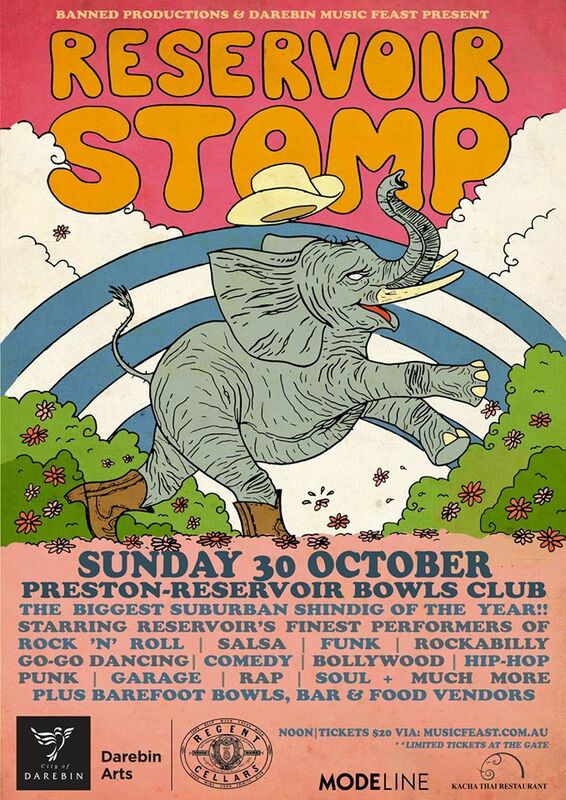 It’s an event called the Reservoir Stomp, a music festival happening at the Preston/Reservoir bowls club on Sunday, October 30. (Cup weekend.) There is a heap of local musical talent on show AND I’m selling some of my Reservoir merch (Tea Towels, aprons etc.) on the day. I am super excited to be part of this excellent event hosted by the amazing Emma Peel and her Rezza cohorts. Emma has a true appreciation of suburban kitsch and has embraced her local surroundings like she’s in her natural habitat. Anyone who acknowledges the beauty of a concrete koala letter-box is cool in my books. So check out the link and grab some tickets, if you’re up for it. I’ve got a good feeling about this one. Yes, it’s been a long time between drinks! I’m loving your new bedding range btw. So nice! Anyhow, I hope you’re doing well and business is booming.